Author: Adams Bodomo. Series edited by: Wilhelm J.G. Möhlig, Bernd Heine. This trilingual dictionary is designed for use in lexicographical and linguistic field methods training. It serves as a database to illustrate many linguistic principles and phenomena in phonology, morphology, syntax and semantics. First and foremost it is intended as a reference source for Chinese and English speaking students. Dagaare is a language spoken in Ghana and Burkina Faso by about two million people. It belongs to the Gur branch of the Niger-Congo family. In spite of the fact that Dagaare is genetically unrelated to Chinese, there are some interesting typological features under which the two languages can be compared. To illustrate, both Dagaare and Chinese are tone languages. But while Chinese has a complex system of four to nine tonemes, Dagaare – like most West African languages – has a two-tone system. 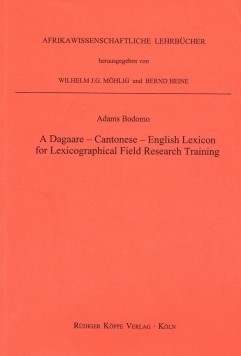 The first part of this book includes information of the orthography and sound system of Dagaare followed by an explanation of the verbal and nominal morphology of this language. Part two is the proper dictionary which comprises more than thousand head words and a total of 3,000 to 4,000 words. Subsequent to the lexicon are represented sample field work projects that are intended to aid both the field trainer and trainee. They cover the areas of phonology, morphosyntax, lexical semantics ans sociolinguistics.